As a rule of thumb, we do not recommend including references on your CV. References take up valuable CV space, and will generally not be needed until after the first interview. For these reasons, it is best to keep references separate from your CV, providing them only after you have been asked to by a potential employer. You can add a bulleted list by clicking the bullet point button in the text editing toolbar, which will appear at the top of the window whenever you edit your resume. Type after the bullet that appears to begin your list. Please note that bullets are not supported in the mobile app. 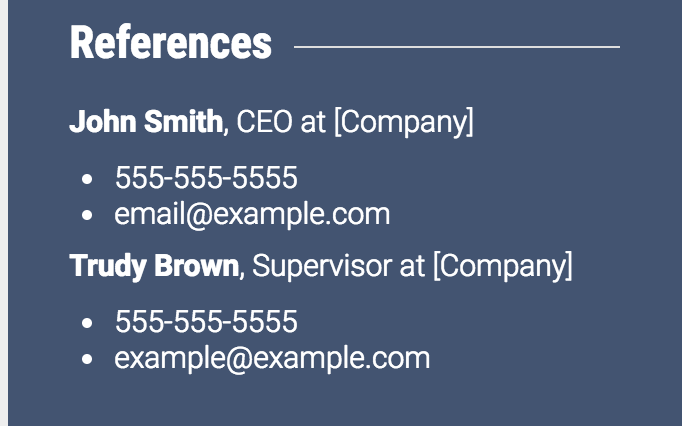 Please access VisualCV using the desktop site to add bullet points.